14 Centre Street, one of the many units owned by Niagara Regional housing, was the first site location of the Through Their Eyes project in St. Catharines. The building itself has a total of 133 one-bedroom units for seniors aged 55 and over and provides a supportive and inclusive environment for people of similar ages to live for a reduced cost, therefore improving quality of life. Assistant Professor at Brock University, Paula Gardner, provided her 45 third and fourth year undergraduate students with the knowledge, tools, and resources to bring this project to life. The 45 students were paired with 20 seniors from the 14 Centre Street location to better understand what makes an age-friendly community through the eyes of the city’s senior citizens. Recruitment for the Through Their Eyes project was needed in order to have enough participants for the number of student groups in the class. The recruitment of senior participants took place at the residents’ apartment. 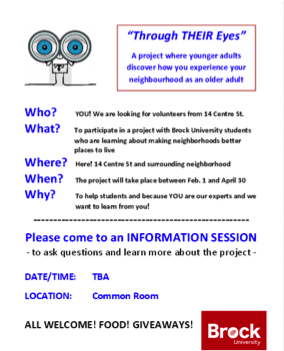 The community program coordinator at 14 Centre Street posted advertisements and asked residents who were interested in learning about the project to attend information sessions in the apartments. The community program coordinator, Paula, and the course Teaching Assistants (TA’s) also attended and offered food, refreshments, and freebies to entice participation. Eligible participants were over the age of 55, living in the apartments at 14 Centre Street, able to go outside, and capable of understanding and answering questions from the students. After determining the residents’ eligibility, their contact information was matched with students from the class. Paula, Cam, and some students from CHSC 3P96 attended the unit’s social events such as BINGO and self-defense classes to explain the Through Their Eyes project with hopes to recruit more participants. Posters about becoming involved with the project were also displayed in the lobby of the apartment. Despite their efforts, recruitment was somewhat difficult due to the fact that some elders did not feel comfortable with students in their home and did not want to be interviewed. The extreme winter weather also played a factor in elders deciding against participation in the go-along interviews. Despite these obstacles, however, many seniors were receptive to the idea of being interviewed and inviting students into their homes, and their involvement with the project was critical to the study’s preliminary findings.